Biological Control of Mycotoxins: An Update. Biological control, or rather the deployment of living organisms in an effort to arrest the growth and development of another organism, is a hot topic in mycotoxin studies. Confirmed environmental inclemency and increasing cases of resistance, brought about by the use of chemical applications have invited the development of natural and better alternatives. Many candidates from bacteria through yeasts to fungi have been exploited to control mycotoxin-producing fungi with appreciable success. This review takes a critical look at the development and harvest the reaction of crop and livestock farmers and other stakeholders and, concludes that the bio- control of mycotoxins is a field with a promising future, in spite of a few research gaps that have to be filled. Improving Reproductive and Productive Efficiency of Barki Sheep by using GnRH and Selenium. Farrag B, El-Hawy AS, El-Bassiony MF. The present study was conducted to investigate the effects of hormonal treatment (GnRH) and/or selenium (Se) supplementation on improving the reproductive and the productive efficiency of Barki ewes. Sixty-two Barki ewes were assigned into four groups. 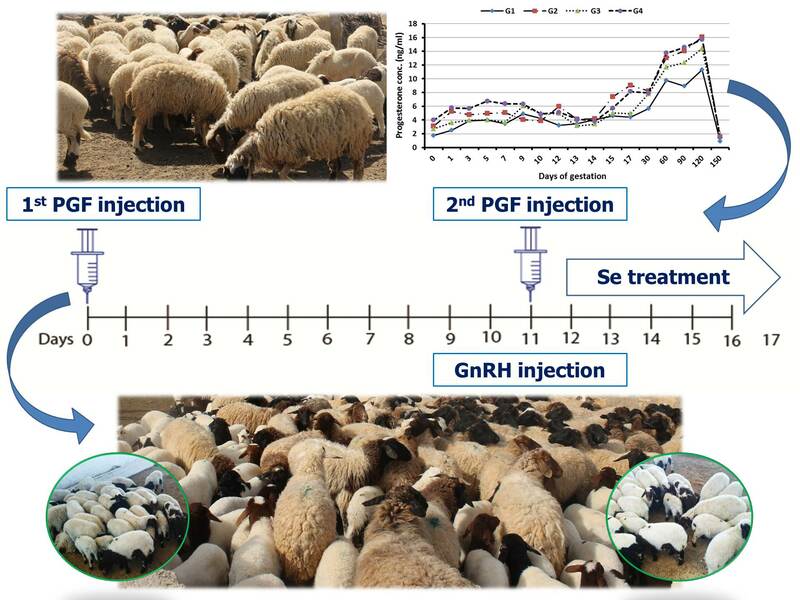 G1 group (15 ewes) severed as a control group only fed CFM, without Se supplementation or GnRH injection, G2 (16 ewes) was estrus-synchronized with double injections of PGF2α 11 days apart and intramuscularly injected with 2 ml of GnRH at day 11 and were fed CFM without Se, G3 (15 ewes) received double injections of PGF2α 11 days apart and were supplemented with Se, while G4 was (16 ewes) estrus-synchronized with double injections of PGF2α 11 days apart and intramuscularly injected with 2 ml of GnRH at day 11 and supplemented with Se. Reproductive parameters, milk yield and composition as well as animal weights were recorded. Progesterone hormone concentration was also measured. The result indicated that conception and lambing rates were higher (P ˂ 0.05) in G4 (93.75%) as compared to G1 (80 %) while G2 and G3 recorded 87.5 and 86.66%, respectively. The numbers of lambs born alive and weaned were higher in all treated groups than the control group. Mortality rate from birth to weaning had increased in the control group than treated ones. Milk yield, milk fat and protein had increased insignificantly in Se groups (G3 and G4). The data of lambs birth weight and average daily gain showed significant increases in G3 and G4, while the weaning weight had not been affected with values being similar. GnRH administration increased plasma progesterone concentration compared with the controls. In conclusion, GnRH administration and Se supplementation improved reproductive parameters and milk yield and composition as well as their lambs' weights, probably through its beneficial effect on embryo survival by enhancing luteal function. Keywords: Reproductive efficiency, Barki sheep, Selenium, GnRH.